This year’s fair includes a special panel discussion about increasing and advancing Black men in medicine. The AAMC (Association of American Medical Colleges) will host its annual medical career awareness workshops and recruitment fair in Boston on Saturday, Nov. 4. This free event, geared primarily toward minority, college and high school students and their parents, is intended to help increase the pipeline of minority students entering the field of medicine. Participants will have the opportunity to meet and interact with representatives from more than 75 U.S. medical schools and other health professions schools (such as dental, physician assistants, and more). Attendees, including pre-health advisers and school administrators, can participate in roundtable discussions with current medical students, interactive medical and health activities, and workshops on medical school preparation, admissions requirements, and the Medical College Admission Test® (MCAT®). This year’s fair includes a special panel discussion about increasing and advancing Black men in medicine. The panel will feature students and physicians who share their experiences in navigating the medical field, as well as resiliency strategies and the importance of supportive, mentoring networks. 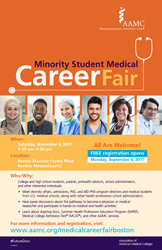 For registration information and other details, visit http://www.aamc.org/medicalcareerfairboston. To view photos of the 2016 Minority Student Medical Career Fair, click here. The AAMC sponsors this event in collaboration with Learn Serve Lead: The AAMC Annual Meeting. Several AAMC member medical institutions and health professions organizations participate, including Harvard Medical School, University of Massachusetts Medical School, Boston University School of Medicine, Tufts University School of Medicine, Geisel School of Medicine at Dartmouth, The Warren Alpert Medical School of Brown University, University of Connecticut School of Medicine, Emory University School of Medicine, Johns Hopkins University School of Medicine, and several other institutions across the United States. The Association of American Medical Colleges is a not-for-profit association dedicated to transforming health care through innovative medical education, cutting-edge patient care, and groundbreaking medical research. Its members comprise all 147 accredited U.S. and 17 accredited Canadian medical schools; nearly 400 major teaching hospitals and health systems, including 51 Department of Veterans Affairs medical centers; and more than 80 academic societies. Through these institutions and organizations, the AAMC serves the leaders of America’s medical schools and teaching hospitals and their nearly 160,000 faculty members, 83,000 medical students, and 115,000 resident physicians. Additional information about the AAMC and its member medical schools and teaching hospitals is available at http://www.aamc.org.